When the roots of Cuban music are traced, one always goes back to the African tradition – U.S-based musicians rarely look to Spain. Yardena y son Ladino successfully finds the common ancestry of Sephardic and Andalusian/Middle Eastern sources with Cuban rhythms and Latin jazz in a unique, dynamic and soulful fusion. 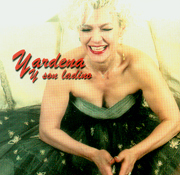 Yardena herself is a major vocal talent whose voice transports us to distant, exotic lands.